I decided to transfer some pictures of Finnan from my brother's online photo account for your viewing ease. 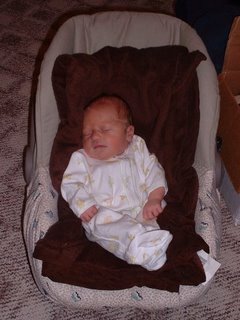 This is a baby in a baby chair. 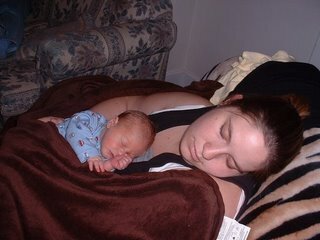 This is Baby-Momma and baby. 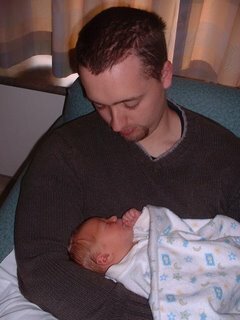 This is my favourite of my brother holding his little son. I guess he's not even a week old yet so he doesn't have that wide eyed baby look yet. Its funny watching video of him and recognizing the complete lack of sensory-motor skills. All in time. I think at this point he looks more like my sister-in-law's side of family but baby faces change so much so we'll just have to see. With any luck he'll be a Coldplay fan. Posted by R at 12:36 p.m.
he is VERY cute. When do you get to see him? So adorable. And of course he'll be a Coldplay fan! He'll have his Dr. Bethany to show him all about it. Don't ever wish Coldplay on anyone, that's a sin, I'm sure of it!